I was going to welcome you all to my blog, but it didn't feel right. I think you all should be welcoming me, since I'm new to the blogging game. What IS the traditional opening post supposed to be like? Well, my name is Judy, and I'm 21 living in a small town of the Berkshires in Massachusetts. I've created this blog because my social life is lagging, and I needed to start something self-indulgent and egotistical. I also want to share my work with the cyberworld... I do art and stuff. (You know... painting, drawing, gluing cereal boxes together... that sort of thing). For most of my life, I was a realistic artist, master of the graphite. Unfortunately my patience wore off... I soon felt like a photo printer rather than an artist. After a three year break from art, I am back with vengence. I'm ready to prove I can draw something besides smiling portraits and fruits. I want to show the world my world. And I'm gonna spill a lot of paint along the way. For now, I'll leave you with a drawing I did many years ago. 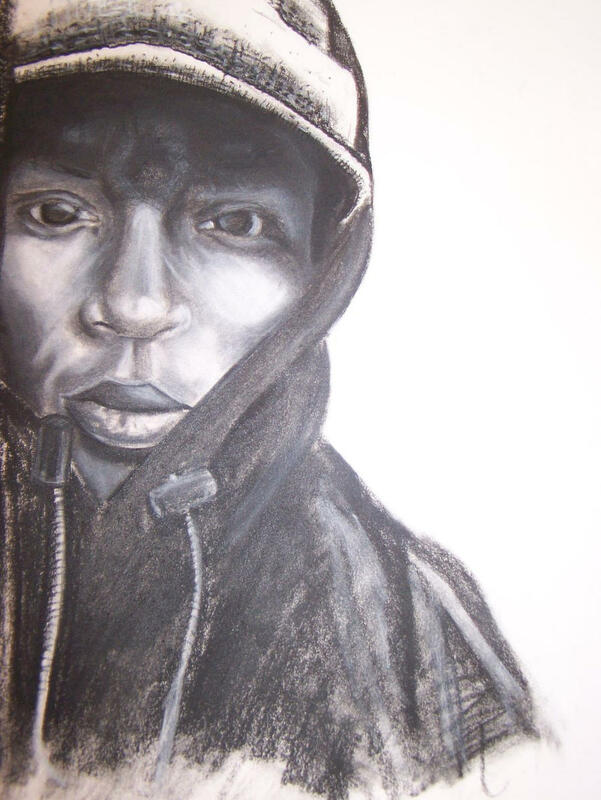 Even though it's in the style I want to move away from, Mos Def and his music still inspires me. Come back soon to see my new art.